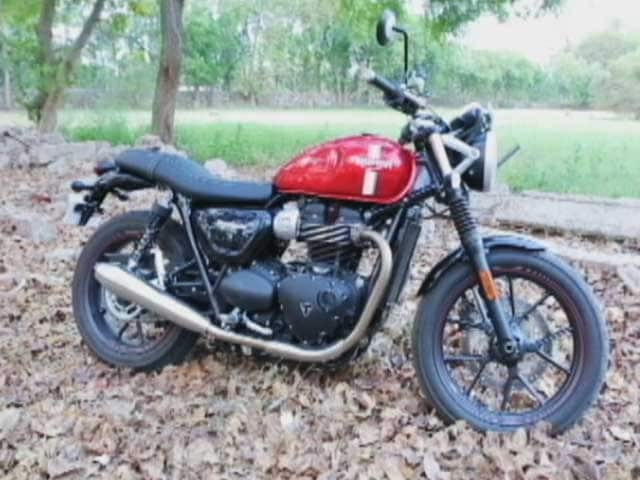 *Actual On Road Price of Triumph Street Twin at the dealership may vary. Triumph’s renewed Street Twin comes with a host of changes evident on the outside as well as under the skin. Looks apart, the motorcycle has received vital mechanical tweaks like a new engine and new chassis. The new powertrain develops a healthy power & torque output, although there is a substantial drop in power figure but torque output has gone up considerably.Efficiency has improved significantly despite slicing off tank size by 25 per cent. Moreover, the bike now weighs around 11kgs lighter as compared to the preceding model. The suspension has also been tweaked making the new Street Twin smoother in terms of ride quality. There has been a visible change in the looks department but the essence of the previous version stays intact. In fact the latest version of Street Twin is being touted as the most modish looking bike from the new range. The entire treatment which is dominated by black finish on the body brings a sense of class to the bike. Rear features LED light befitted carefully in the tail. The fuel tank appears a tad dated and mud-guards at front as well as rear have been trimmed proportionally. Upward brushed exhausts are made of stainless steel and the panels at flanks are finished in black. Hardware running the new Street Twin is an all new 900cc, parallel twin, liquid-cooled engine which generates max power of 55PS at 5900rpm along with 80Nm of torque at 3230rpm. The rise in torque production is notable by 12Nm, whereas as mentioned above, the pinnacle power figure has dropped as compared to predecessor. A five-speed gearbox is paired to the new 900cc engine. The motorcycle gets halogen head lamp, LED tail lamp, analogue speedometer, tripmeter, fuel gauge, electric start, ride-by-wire-throttle, traction control, anti-lock-braking system etc. Braking power is supplied by 310mm disc brakes in front and rear. Moreover, the braking action is not dependent on these, to add further dint, Triumph has incorporated anti-lock-braking system. Tyres sized 100/90-18 and 150/70 R17 are equipped in front and rear respectively. 18 inch black finished alloy wheels are shod to front and rear tyres. The overhauled 900cc bike has competitors such as Harley Davidson Superlow, Ducati Scrambler and Hyosung ST7. New powertrain, modish looks and well equipped. The 2019 Triumph Street Twin has got an 18 per cent increase in horsepower and the engine gets a few updates, along with two riding modes.